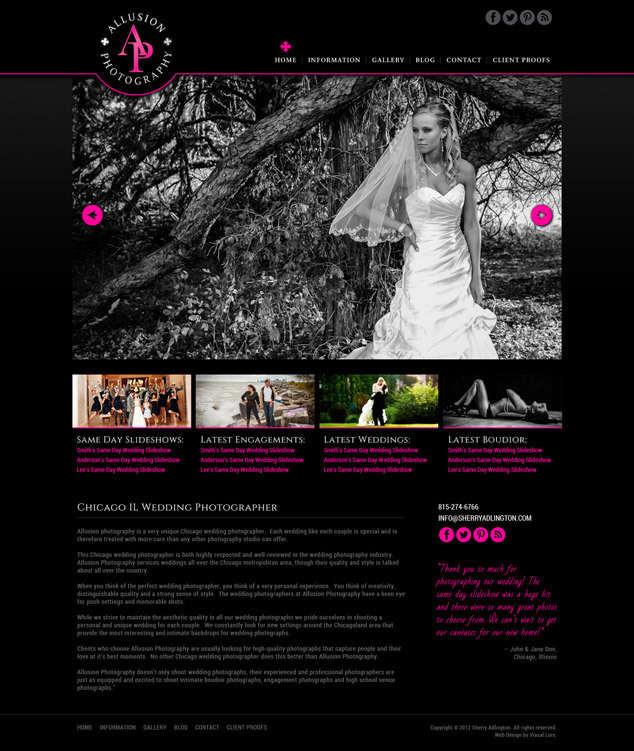 Visual Lure was recently contracted to design a new logo and custom WordPress website for Allusion Photography, a Chicago, IL photography company specializing in Engagements, Weddings, Boudior and Seniors. The new website will be built using a custom WordPress theme along with custom plugins which will make it easy for the client to maintain her gallery, slideshows and blog. Visual Lure will also be providing search engine optimization (SEO) services, guidance and training in order for the client to build a strategic long-term SEO strategy. Below is a sneak peek at a couple of the main web pages. Check back soon for the official launch of the new website design.